Planning your Florida holidays 2019? It's not too early to start thinking about your 2019 Florida holidays. Booking early will net you the best prices and first choice of accommodation. Popular dates (Easter, summer and Christmas) will be snapped up early so act quickly and get to the front of the queue. Early bookers could even halve the cost of their Florida holiday. We don't compromise on quality. Our Orlando flights are booked with British Airways, Virgin, United or Thomson. And we have a wide selection of quality villas, apartments and hotels to choose from. We can even arrange your car hire with full insurance. All of our 2019 Florida holidays are ATOL protected and can be booked with a deposit of just £100 per person. Balances are due 90 days before departure, giving you plenty of time to budget. We have 2019 Florida holiday offers for every month of the year – read some of the suggestions on this page. But you're not restricted to our offers – we can tailor-make any 2019 Florida holiday. Complete a quick enquiry form or call us on 01934 319 851 for a personalised quote. After a busy festive period, why not aim for a January 2019 Florida holiday? The low-season flights to Orlando are great value and the mild winter sun is a welcome break from the cold UK weather. The children are back at school so this is a great opportunity for adults to enjoy Florida in the quiet season. 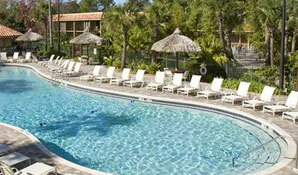 Our suggestion is two weeks at Tuscana Resort just 15 minutes drive from Disney. Universal is not much further away. Our holiday includes fully-insured vehicle hire so you can explore Florida at your leisure. A February 2019 Florida holiday can be great value even during half-term – Virgin and BA flights are still in the low season. 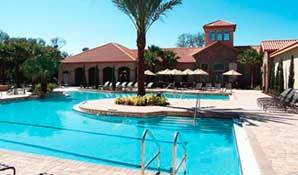 Our offer includes a fortnight at Doubletree by Hilton Orlando. We include flights and a fully-insured vehicle hire. Your hotel is a quick 30-minute drive from the airport and is ideally situated for shopping, restaurants, shows, attractions, cinema, bowling and more. SeaWorld, Disney World and Universal are all close by. Perhaps you'd like to stay in a luxury Emerald Island Resort villa next door to Disney? If so, our March 2019 Florida holiday might appeal. 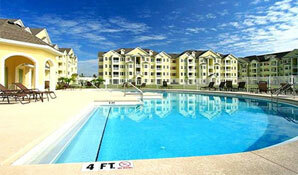 Emerald Island is 300-acre community located in central Florida near to Disney World. It has a wonderful range of facilities including a clubhouse sauna, fitness centre, games arcade, spas, volleyball, tennis courts and more. 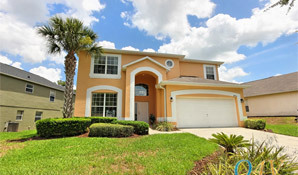 Our March 2019 Florida holiday includes Orlando flights, two weeks in a luxury villa and a fully-insured vehicle hire. If you need to fly during the popular Easter dates, don't worry – there are plenty of great offers for early bookers. Our April 2019 Florida holiday includes flights from your local airport, a fortnight in a luxury Highlands Reserve villa and a fully-insured vehicle hire. Take in a round of golf at the championship 18-hole course, drive to the beautiful coastlines, enjoy the theme parks. Our Easter 2019 Florida holiday will be one to remember. May is terrific month to visit Florida. The airlines fly a summer schedule but the demand is lower – resulting in great value Orlando flights. Another advantage is less queuing time at the theme parks! If this sounds enticing, why not take a look at our May 2019 Florida holiday? We can offer two weeks at the Blue Heron Beach Resort, flights to Orlando and minivan hire – all starting at just £875 per person. June is another good month for a Florida getaway. Enjoy summer's best prices with an early June departure date. 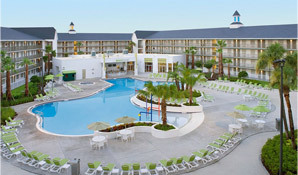 Our June 2019 Florida holiday includes two weeks at Cane Island Resort in Kissimmee along with fully-insured vehicle hire. We also include direct Virgin flights from London, Manchester or Glasgow. All this from just £825 per person, based on a party of six adults. If you're flying from Scotland or Ireland and need to depart late June, we'd advise you to book early. Scottish and Irish schools break up in late June so flights can be expensive unless you're quick. Early bookers can take advantage of our June/July 2019 Florida holidays from Scotland or Ireland. 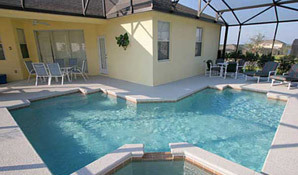 Stay in a good quality villa in Davenport or Kissimmee with flights and fully-insured vehicle hire included. If you're planning a holiday during the spooky season, our October 2019 Florida holiday might appeal. The parks run special Halloween events for the full month so don't worry if you need to return home before the 31st. Our holiday includes 14 nights at Emerald Island – you're so close to Disney you can see the nightly firework display from your villa! We also include Orlando flights and vehicle hire, but you'll need to be quick – October is a popular time for Florida and flights will be snapped up quickly. The offers above are all great value, but you're not restricted to our ideas. We can tailor-make any 2019 Florida holiday to suit your requirements. Contact us today on 01934 319 851 or complete our online enquiry form. Book your 2019 Florida holidays with a deposit of just £100 per person, ATOL protected. Enquire today!